Sam Karl put Loxwood 2-0 up in their 3-3 away draw with Hassocks in the Premier Division on Saturday. Picture by Steve Robards. 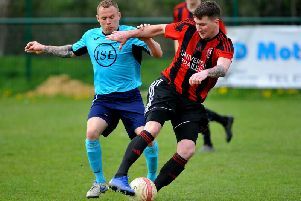 Alex Walsh rued a ‘silly ten minutes’ as Loxwood picked up a 3-3 draw away to Hassocks in the Premier Division on Saturday, despite leading 3-0 at half-time. The result sees the Plaistow Road-outfit remain second-from-bottom but they are now level on points with Little Common, separated only by goal difference. Walsh said: “It was mixed emotions really. We targeted this game and wanted to come out of the blocks and start well and we wanted to try and get three points on the board. “It was a great start for us. We dominated the first-half and all the things we put into practice during the week in training came off. “I was really pleased with how we started the game but it was a tale of two halves. “In the second-half the wind was a huge factor in the game and they came out and got that early goal and it gave them a confidence boost. “They found themselves scoring three goals in the space of ten minutes so it was frustrating. We thought we’d learned our lesson from the Pagham game. The Loxwood goals came at regular intervals. Goldson opened the scoring on ten minutes before Karl doubled the lead on 24 and then French made it three eight minutes before the break. Just four minutes of the second-half had elapsed when Slaughter, Brown and Phil Johnson linked up to fashion a chance for Enticknap who made no mistake, smashing the ball past Liam Matthews and into the top corner. Three minutes later and Slaughter started a break down the right that was finished off by Brown. It was a brilliant passing move that gave Hassocks their equaliser four minutes after Brown’s strike, as Johnson crossed to Slaughter who slid in at the far post to score. Loxwood pulled themselves together and did well to weather the rest of the Robins storm, taking the sting out of the game. Walsh added: “We know we’ve got goals in our team, that’s never been a problem. Defensively we’ve been good at times but we know as a group that we need to be focussed and switched on and deal with circumstances and scenarios that may occur in the game. “We’re trying to win every game so it’s a point on the board, and that’s a positive when some others have dropped points. The Magpies travel to sixth-placed Lingfield on Saturday. Loxwood: Matthews, Dawson, Broughton, French, Boiling, Courtney, Cowan, Westlake, Karl, Goldson, T Bennett. Subs: Williams, E Bennett, Swaine, Mutongerwa, Lapite.